Underlying the development of the Tone Scale and Chart of Human Evaluation was a monumental breakthrough: The Theta-MEST Theory, containing the explanation of the interaction between Life— theta —with the physical universe of Matter, Energy, Space and Time— MEST. 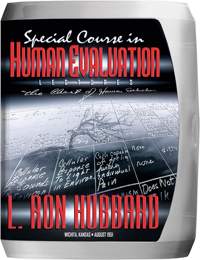 In these lectures, delivered to students immediately following publication of the book, L. Ron Hubbard gave the most expansive description of all that lies behind the Chart of Human Evaluation and its application in life itself. Moreover, here also is the explanation of how the ratio of theta and en(turbulated)-theta determines one’s position on the Tone Scale and the means to ascend to higher states. Man has long puzzled over the behavior of his fellows. Why do people act as they do? How can one know who to trust? Who to watch out for? Who to depend on? 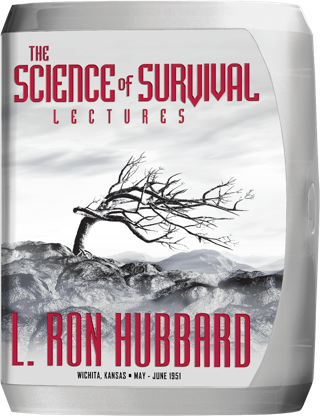 It was the fall of 1950 and L. Ron Hubbard was crisscrossing the country, from Elizabeth, New Jersey, to Los Angeles to Kansas City, providing guidance and instruction to the rapidly growing Dianetics movement. Yet at the same time, he was also continuing his search for the “better Bridge” called for on the final page of Book One. His next step in engineering that Bridge was to widen and strengthen it to accommodate all cases—specifically, to provide the means to access and crack any case at any level. The key to this lay in Book One itself—the “Graph of Survival,” revealing a scale from death and ultimate pain at the bottom to potential immortality and ultimate pleasure at the top. With this as his point of departure, L. Ron Hubbard commenced an investigation into the underlying principles monitoring a being’s level on the scale—thus providing the means to raise it. His ensuing research, conducted in early 1951 at his Palm Springs, California home, soon yielded a discovery of sweeping importance. In fact, it was there and then he revealed an entirely new view of Man as a Life Force (designated by the Greek letter theta) enmeshed in the physical universe of matter, energy, space and time (MEST). From this pivotal Theta–MEST Theory, all else began to rapidly unfold, revealing the complete manifestations of human emotion, character and behavior at every level. Soon, that simple Graph of Survival had expanded to encompass all facets of human action and reaction, and thus came the monumental Hubbard Chart of Human Evaluation. 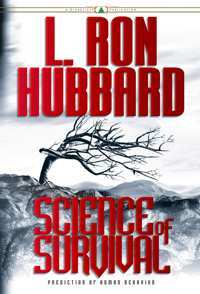 Next, Mr. Hubbard authored the comprehensive, all-encompassing text—describing in detail every column of the Chart and its use: Science of Survival. Here, then, were not only the “simpler, faster Dianetic techniques” L. Ron Hubbard had searched for, but a breakthrough that would provide a new direction for the subject resulting in gains beyond even those envisioned in Dianetics. To spearhead this advance, Mr. Hubbard established a centralized headquarters, accessible to both East and West coasts, in Wichita, Kansas. Dianeticists from across the nation joined him at the new Foundation located at 211 Douglas Avenue, which featured twenty-six rooms and a large lecture hall. To illustrate the new technique, he ended with a demonstration session that provided a glimpse of its potential—relieving a preclear of a persistent headache that had been troubling the man for almost a month. 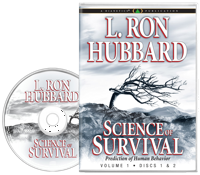 These lectures stand as L. Ron Hubbard’s most expansive description of all that lay behind the Chart and its full application, providing the first accurate prediction of human behavior. Here, too, is the full explanation of what determines one’s position on the Tone Scale—and thus the means to ascend to higher states.